Text and photos © 2019 Steve D'Antonio Marine Consulting, Inc.
Not long ago, a client and I spoke about the work that was being carried out aboard a vessel he recently purchased. He, his wife and their children plan to move aboard in the near future to begin their full-time cruising adventure. For the moment, however, he's still working and flying between his home and the boat every week or two to meet with mechanics, electricians, carpenters and other industry professionals, to review in-progress and upcoming tasks. I've strongly encouraged him to take an active role in the refit, including onsite inspections and meetings, rather than attempting to manage these projects from afar; an approach that nearly always results in an unsatisfactory outcome. After one such meeting, he lamented how one of the professionals with whom he met talked a great deal, although mostly about things other than the project he was working on for this client. That caught my attention. When I managed a boat yard my office had the proverbial revolving door, employees entered and left all day long looking for guidance, advice and assistance with various projects and challenges, it was frenetic to say the least. Getting work completed in that environment could be challenging. I adopted two techniques which were helpful, the first involved a mandate on my part, which went like this, “If you bring me a question, be prepared with your own answer”. That approach ensured the person looking for help had given some thought to the problem, rather than simply coming to me for a quick fix. The second included a time limitation, if someone stopped in and said, “I need help with this…” I'd respond by saying, “I can give you five minutes now, or we can schedule a longer meeting later today or tomorrow”. Once the staff became accustomed to these guidelines, the number of visits, and their duration (and the time it took these folks away from their work), dropped noticeably. One other factor played a role in the number of visits I received; the second floor office I used for a few years received fewer drop ins than the first floor office, I referred to the steps leading to it as, “The stairway of contemplation”, those who climbed them usually had a good reason for doing so. In that role I learned a great deal about time management, while developing a keen sense of appreciation for those who valued my time, and their own. Those who could share with me exactly what I needed to know, and little extra, received my appreciation and recognition. Today, when I work with clients, I make an effort to respect the value of their time. For my colleagues in the industry, keep in mind the value of your client's time, share with them what they need to know quickly and professionally (give them what I call "the four", what's wrong, what will it take to fix it, how much will it cost and how long will it take, all in one shot), while keeping the small talk to a minimum, it will almost certainly be appreciated. This month's eMagazine feature article covers the subject of damage control. I hope you find it both interesting and useful. 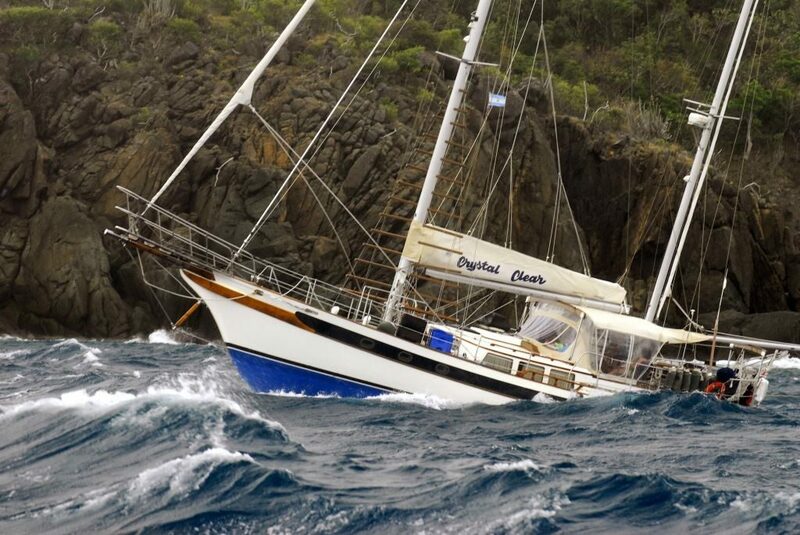 Damage control events rarely occur in benign conditions; heavy weather is when gear, vessel and crew, are tested. Every vessel operator, at one time or another, faces a damage control scenario, wherein a piece gear fails, sometimes benignly, sometimes catastrophically. The “gear” could be anything from a failed raw water hose to a breached hull. If it hasn't happened to you, yet, you've been fortunate, however, the law of averages is against you, the more time you spend underway, the more likely this is to occur. Excessively leveraged raw water plumbing components are a damage control scenario waiting to happen. A well-maintained vessel is less likely to suffer avoidable failures that require damage control measures, or they may be less intensive. However, regardless of a vessel's operating condition, difficult to predict events, striking a submerged object or running aground, for instance can lead to flooding and the need to quickly and effectively deal with the results thereof. By the same token, steering system failures and rig collapses all represent “opportunities” for a vessel's crew to either rise to the occasion and stem the tide, figuratively as well as literally, or break out the EPIRB and abandon ship. Naturally, the former is preferred wherever possible, keeping the vessel afloat, first and foremost, and then underway and self-sufficient, are priorities where damage control measures are concerned. Hull damage like that shown here, suffered by this vessel while cruising to Bermuda, will test a crew's damage control skills. This is the most common type of onboard emergency that requires damage control measures, and it's the one for which every vessel operator and crew should be prepared. There are two primary types of flooding. The first occurs as a result of a breach in the hull, from a collision with a submerged object or other vessel, grounding or a failed through hull fitting (this is the component that passes through the hull and interfaces with a seacock), or underwater hardware attachment point, such as a strut or shaft log. It may also involve ‘down-flooding', a phenomenon wherein water enters the vessel through an existing breach or opening rather than as a result of damage or a failed component; this could include a port, window or windshield, hatch or vent, even a shore power cable reel entry point. This may also occur if the vessel heels or is awash as a result of heavy weather, or a grounding and “drying”, where the vessel heels over and is ultimately left high and dry as the tide falls, and then rises again. When this occurs, the vessel may heel enough to admit water from openings that are normally well above the waterline, with the most common being engine room vents, cockpit hatches and sail lockers. Running gear components like struts, shaft logs and shafts are vulnerable to damage when running aground or striking submerged objects; which often leads to flooding. In any of these cases water enters the vessel, often at a prodigious rate. A one inch hole one foot below the waterline will admit 1,200 gallons per hour, while a two inch hole two feet below the waterline will admit over 6,000 gallons per hour. If you're thinking that a bilge pump can keep up with flood rates like these, particularly the two inch hole example, unless it's of the ultra-high capacity “crash pump” variety (typically hydraulic, or small engine-powered), you can forget it, it's simply not practical in most scenarios (for more on bilge pump system design and installation see pumps 1). 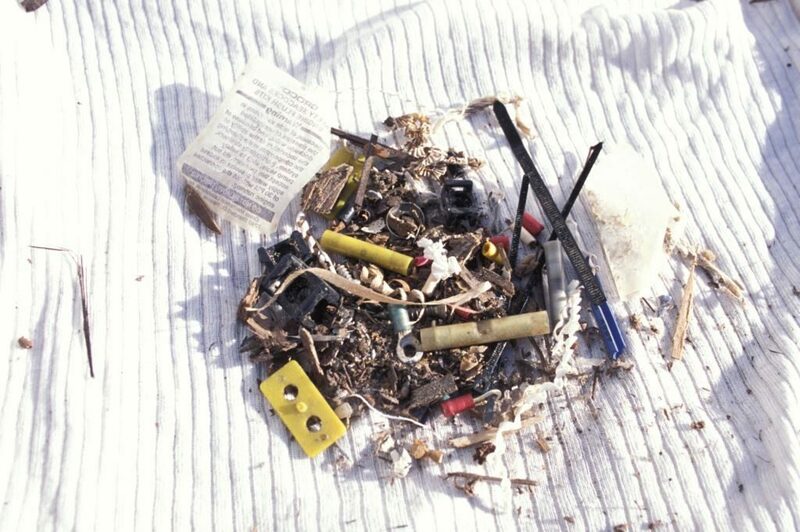 When flooding occurs, trash and building debris are invariably washed into bilges, and bilge pumps. 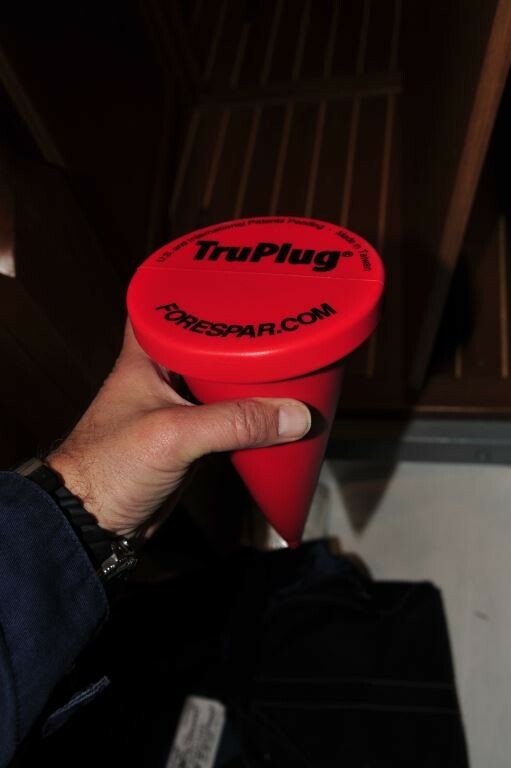 Keeping your bilges clean reduces the likelihood of clogged pump strainers. 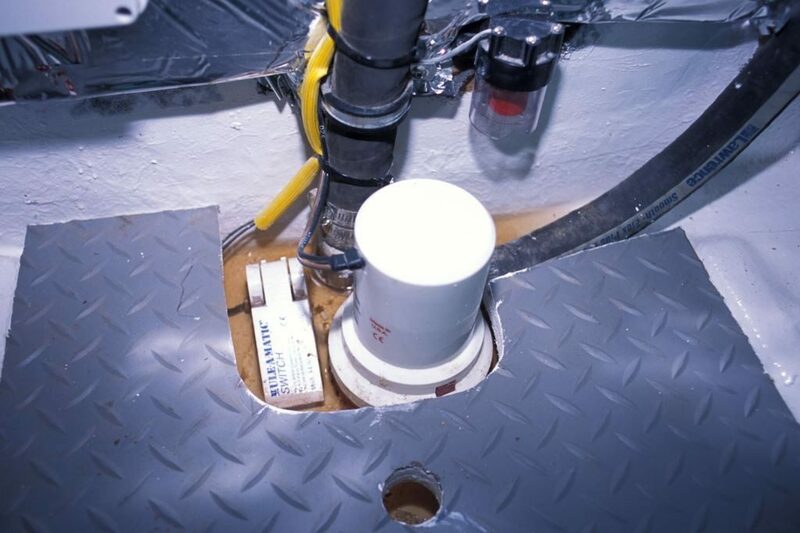 The second type of flooding results from the failure of plumbing within the vessel, a parted raw water or stuffing box hose, or broken plumbing such as a sea strainer, air-conditioning, or wash-down pump or related components (more often than not these are the result of neglect). The result is the same; however, water enters the hull envelope. It's worth noting, new vessels are not immune to these failures; builder errors in raw water plumbing component design, selection and assembly often result in leaks and occasionally flooding. Nearly all flooding that is the result of failed below the waterline plumbing is preventable. Inspect your raw water systems regularly. 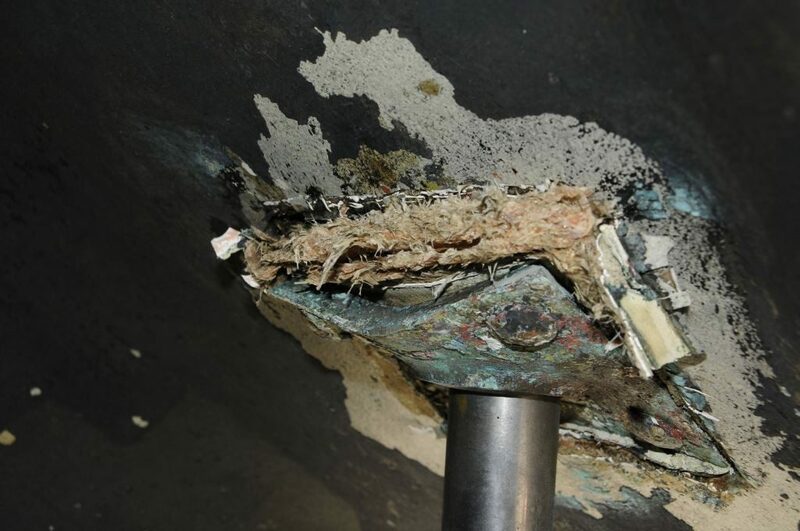 According to BoatUS insurance claim statistics, fully 40% of all underway sinkings are the result of striking a submerged object, while 16% are the result of a broken propeller shaft or strut, and another 16% the result of damaged or deteriorated below the waterline plumbing. The watch words where damage control is concerned are planning and preparation. Priority must first be given to finding and stemming the source of the leak, then to dewatering the vessel. If you can do both, that's desirable, however, if you only have enough resources to attack one, it must be the water entry issue. Successfully doing so means possessing a thorough understanding of your vessel and its various engineering spaces and bilges, this includes knowing the location of every seacock, and ensuring it's readily accessible and functional, ideally these should be cycled no less than quarterly. Toward this end, conspicuously post a chart identifying the location of every seacock (and fire extinguisher), and through hull fitting above and below the waterline, especially if you are cruising or racing with guests (in the latter case, post the chart in the head where those who are seated have no choice but to study it). The responsible skipper should know where every through hull fitting and seacock is aboard his or her vessel. A seacock “map” should be conspicuously posted aboard the vessel. 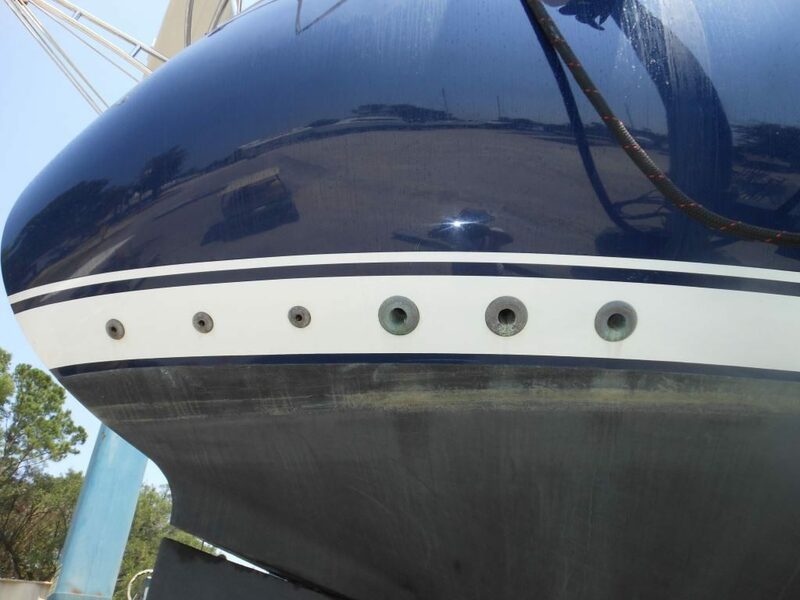 In the case of a collision with a submerged object or a grounding, the most challenging aspect of carrying out your damage control plan often involves accessing the inside of the hull where the breach has occurred. Cabinetry and other joiner-work often makes this very difficult, particularly if the vessel is equipped with a fiberglass liner. You should, therefore, be prepared, to the extent it is possible, to cut, chop or smash joiner-work to get to the source of the leak. This may involve the use of a hatchet (I prefer a kindling hatchet, these are blunter and heavier than conventional hatchets), and a maul. 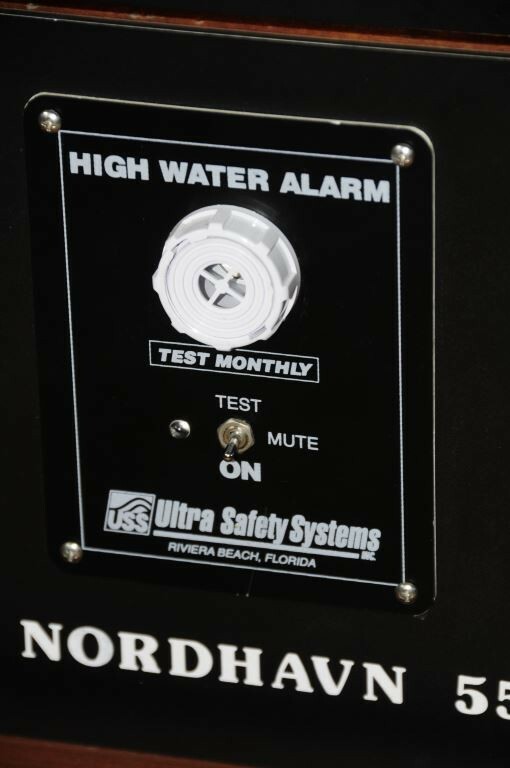 High water alarms should be an essential part of every bilge pump system. Here, a battery-powered, piercing annunciator (top) is impossible to ignore, however, the float switch (above) used to trigger it is too high, it should be located no more than two inches at most above the bilge pump's own switch. Soft wood plugs (cedar is ideal, teak and other hard woods are undesirable), or one of the newer synthetic variety. I'm not an advocate of attaching a plug to every seacock; they get in the way and often deteriorate. Two or three one-foot square 5/16-inch-thick sections of plywood, these are thin and flexible enough to conform to hull shape. Square drive, stainless steel cutting point screws, often called PK (after the manufacturer, Parker-Kalon). These are designed to cut through sheet metal; however, they work very well on wood, fiberglass and aluminum. With a cordless drill, and square driver bit, they can be used to secure patches in place. Sealant, fast cure polyurethane is well suited to these repairs, it cures while wet. Two part putty-like epoxy, it too cures underwater (Evercoat manufactures such a product). Waterproof duct, “100 Mile an Hour” or “Rescue” tape, or your favorite equivalent, as well as a roll of self-amalgamating tape. A few patches (preferably slightly larger than your 1x1 foot plywood squares) of felt padding for filling voids. A light blanket also works well. An exterior hull patch or collision mat. Expanding foam in a spray can, it's well suited to filling voids and placing pressure on patches. Available on line and form home improvement stores. Of course, you can and should make use of other items that are already aboard your vessel, including cushions, pillows, mattresses, hatch covers etc. An engine room hatch with insulation already attached can work very well as a pre-made form -fitting patch. If you aren't up to making your own, ready-made damage control kits are available off the shelf from Sea Kits 2. 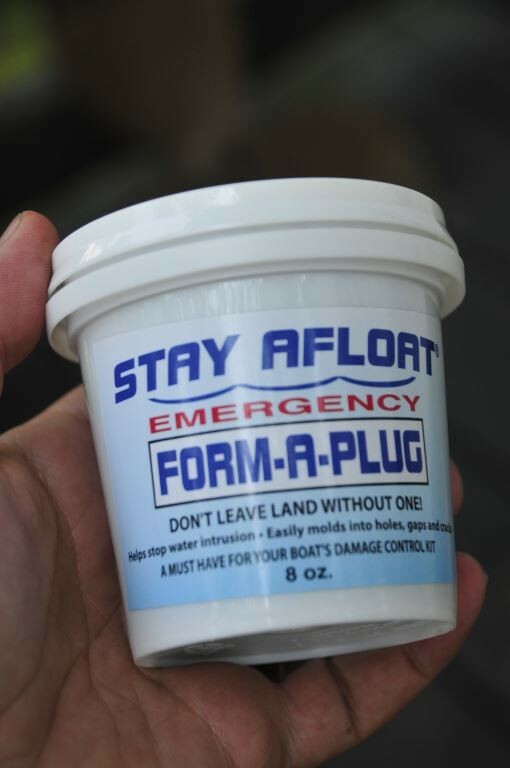 Your damage control kit should include plugs that can be used to fill holes, this version is made from closed cell foam, it can be used to fill irregular-shaped gaps. 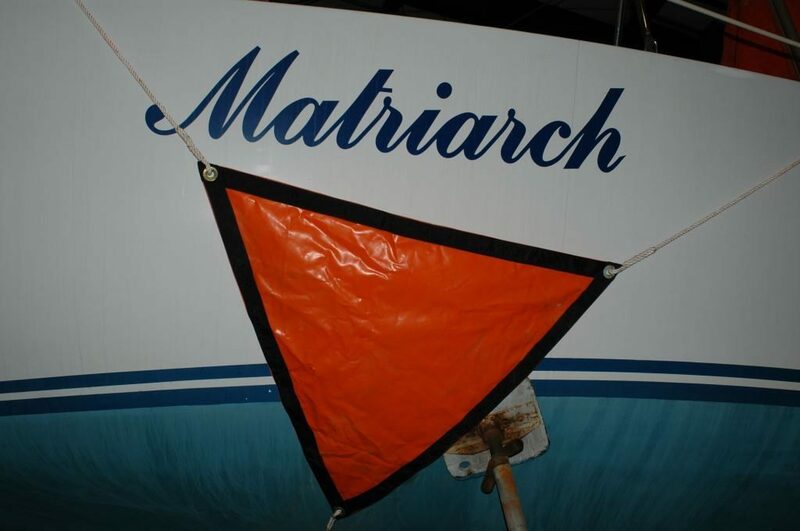 If the breach can't be accessed from inside the vessel, you may have to resort to tried and true mariner's trick of “fothering” a sail, or placing fabric patch on the outside of the hull. This technique has been used many times over centuries of seafaring, notably by the crews of the Mayflower and Captain Cook's HMS Endeavour. If your vessel doesn't have sails all is not lost, triangular hull patches or “collision mats” with lines affixed to each point are available. 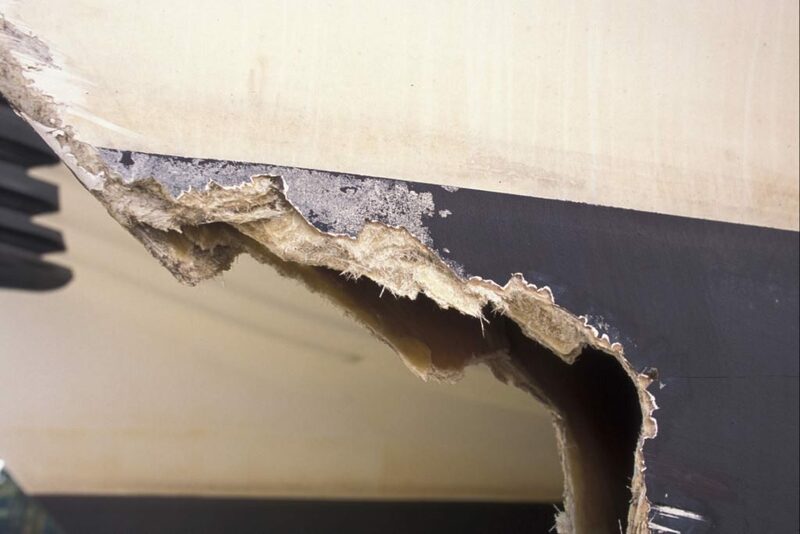 Collision mats can prove useful in the event a damaged hull section cannot be accessed from the interior. Give thought to your vessel's design, what would happen if you ran aground on a falling tide and the vessel was left high and dry? 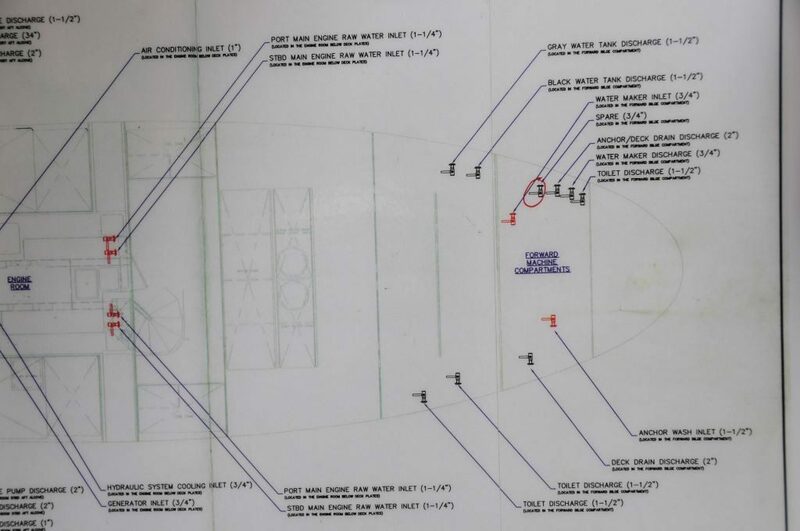 As mentioned previously, vessels equipped with vents in the hull could be susceptible to down flooding, and the same could be true of cockpit hatches. Do you have a way to cover or secure these openings? Suitably strong tape and heavy plastic may be all that's needed. 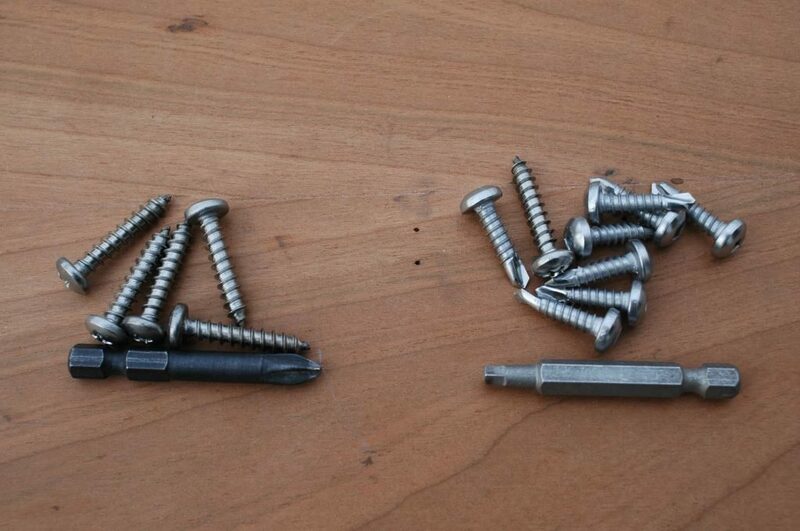 Conventional Phillips head tapping screws, left, and cutting tip, square-drive screws, right, should be part of every damage control kit. Both must be stainless steel to ensure they don't rust while in storage. 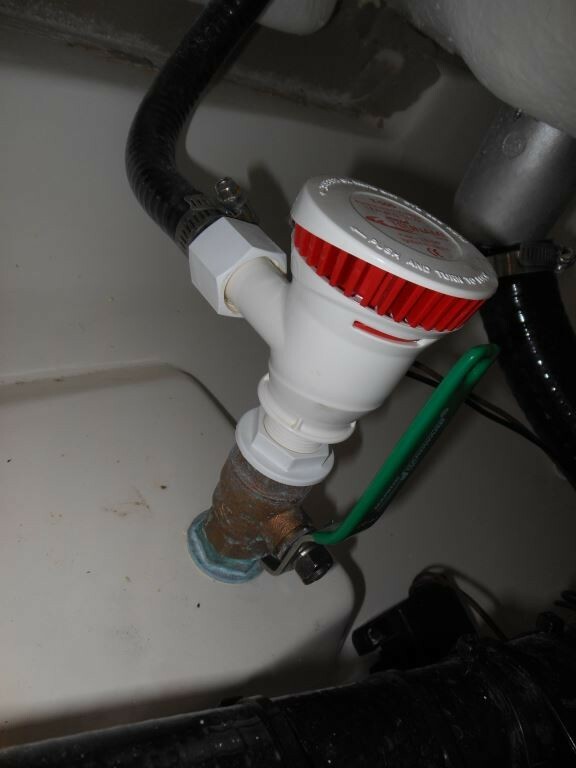 Internal leaks, those that come from failed hoses or plumbing, may be easier to deal with in that in many cases all that's required to stop the ingress of water is closing a seacock. That may be easier said than done, however. If the leak is, by the time it's noticed, under water, then finding it and determining if a seacock can stop it may be difficult. If the source of flooding isn't immediately clear, quickly closing all seacocks, other than those for the engine and generator, makes good sense. Engine and genset plumbing should be inspected as soon as possible thereafter; however, disabling this gear by shutting seacocks can be a liability as it is a source of power for bilge pumps, and communications, as well as propelling the vessel to safety, rendezvous with assistance, a haul out, or even beaching if necessary. While pumps will likely not be able to stay ahead of anything but a minor leak, they may buy precious minutes to find and fix it, so don't discount their value entirely. The consistency of peanut butter, proprietary damage control sealant can be forced into cracks and voids both inside and outside the vessel. Failed hoses and pipes should be replaced if possible, and if not patched with tape, hose clamps and/or seizing wire. The same is true for a stuffing box hose, a particularly debilitating failure in that replacement is impossible without hauling the vessel. 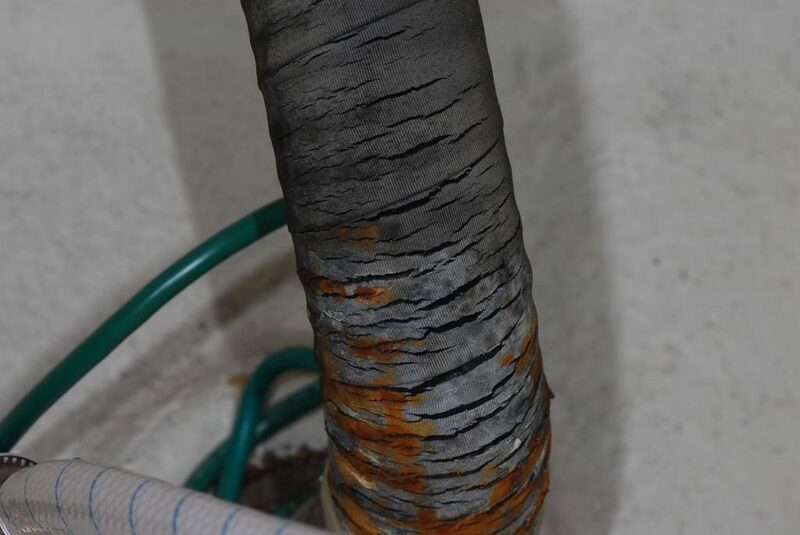 Stuffing box hoses should be inspected regularly for any signs of deterioration, cracking or leaks; at last one dripless stuffing box manufacturer stipulates a six year preemptive replacement interval, regardless of hose condition. In the event of a failure, be prepared to wrap it with plastic, tape and splints if necessary. 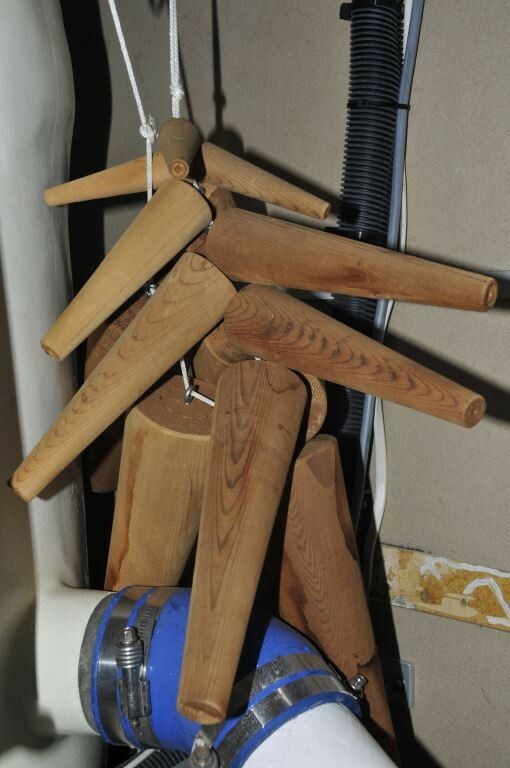 Soft wood plugs, typically cedar, are old-school but useful, keep a supply aboard. Many years ago, as a young member of the Naval Sea Cadet Corps, I had the opportunity to undergo damage control training aboard the USS Buttercup, at the naval base in Newport Rhode Island. Buttercup was barge of sorts that floated, and sank at times albeit under controlled conditions, in an indoor pool whose cold, oily water lent an air of realism the exercise, its flooding and lurching machinations controlled by a salty Chief Petty Officer from a nearby control station. Using patches, wedges, clamps, blankets and mattresses leaks were patched, and the vessel kept afloat using powerful venturi-type pumps. This training drove home several points, chief among them are flooding can be extremely frightening, even when simulated, and you can never have enough DC gear or training in its use. 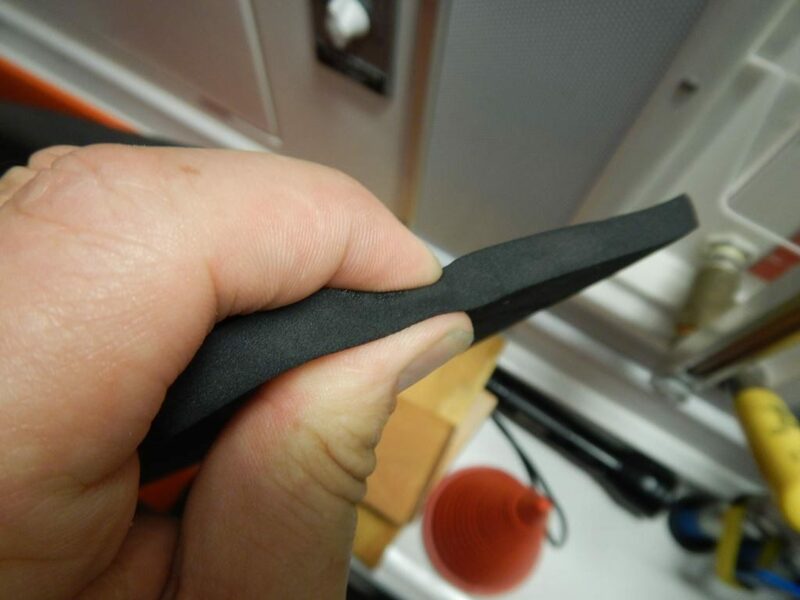 Soft foam rubber mat sections can be used to fill gaps and account for hull curvature when making patches. More recently, two high-profile collisions between US warships, the USS McCain and the USS Fitzgerald, and merchant vessels, while controversial in and of themselves, reinforced the value of damage control, both vessels were saved as a result of their well-trained DC parties. In light of that, it's important to be prepared, make sure you have what's needed in your DC locker, make sure you thoroughly understand how to use it quickly and effectively, and know where all of your through hull fittings and seacocks are located.